Everything you need to know about Pathophysiology… at a Glance! From the publishers of the market-leading at a Glance series, and from the authors of the successful Fundamentals of Applied Pathophysiology textbook comes the ideal revision guide for all the key diseases and conditions that nursing and healthcare students need to be aware of. Combining superb illustrations with accessible and informative text, this book is perfect for all nursing and healthcare students, and anyone who is looking for an overview of pathophysiology. Pathophysiology for Nurses at a Glance covers all the key diseases and disease processes affecting each body system, and key concepts encountered from the start of the pre-registration nursing or healthcare course. 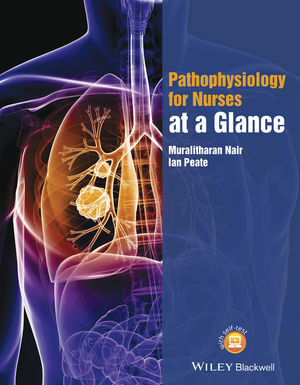 Pathophysiology for Nurses at a Glance is ideal for nursing and healthcare students as well as qualified practitioners, providing a comprehensive yet accessible overview of human pathophysiology. Pathophysiology for Nurses at a Glance companion website features multiple-choice questions and case studies.